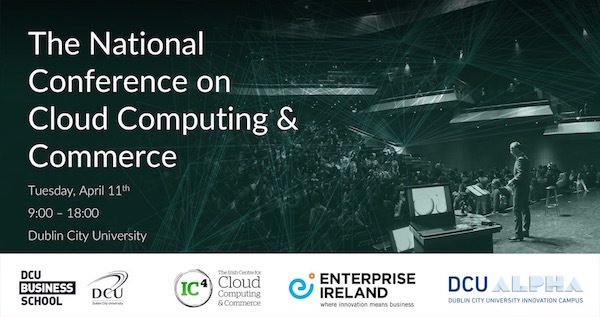 The National Conference on Cloud Computing and Commerce (NC4) is Ireland's premier cloud computing event for both industry and researchers. This is the sixth year of NC4 and the aim is to raise further awareness of the role cloud computing can play in helping to drive economic growth, support job creation and to deliver savings and efficiencies in the public and private sector in Ireland. Audience profile includes the CIOs, CTOs and Founder/CEOs of leading technology SMEs and start-ups, entrepreneurs investing in technology for growth as well as IC4 member representatives from leading corporates such as IBM, Oracle, Deloitte, Magnet, Intel and Microsoft. “I love the scope of NC4 and its unique ability to bring together leading entrepreneurs, global thought-leaders and outstanding academics and innovators”, says Joan Mulvihill, IC4’s Centre Director. “With a multi-track conference such as this, NC4 provides depth of knowledge sharing for business owners, researchers and IT professionals and its impact is clearly seen in the number of returning delegates each year. This really is the definitive cloud computing conference in Ireland”. The conference consists of four parallel tracks, which focus on different aspects of cloud computing, followed by a plenary session where all the attendees come together to hear from internationally renowned experts from the cloud computing business community. The Internet of Things and our connected future in health, money and cars. Next Generation Resource Management for cloud/HPC. The track sessions will be followed by an afternoon plenary from 16:00 – 18:00 which will be held in The Helix. The plenary will feature stand-out presentations from business leaders and industry experts sharing their insights into the future of everything: Money, Health and the role of cloud as the great enabler. The current programme is available on http://www.nc4.ie/ and comprises of over 20 guest speakers from industry and academia including Newswhip, Swrve, Microsoft, Nokia Bell Labs, Intel and many more. Registration is free but places are limited and early registration is advised. If you are interested in attending, please click here.